Before the advent of fireplace grates, people relied on andirons. You probably have heard them referred by the name firedogs, and this is because of their dog-like stance when placed in front of the fireplace or hearth. Although invented many centuries ago, people today still love these accessories. They help support the logs, enhance the elegance of the surrounding, and also bring out an authentic appeal. With all types of items on the market, it’s not always simple or easy to choose the best product. And this is what drove us to review the top 10 best fireplace andirons in 2019. But before we reveal our top products, do you know the critical features to look at? Solid: It is well-constructed from materials such as cast iron, wrought iron, and many others. Stable: The accessory will support the logs and remain stable. This minimizes the likelihood of the logs rolling over or falling. Elegant: It should be well-designed and elegant so as to improve the aesthetic appeal around the fireplace and home. Size: The size of the fireplace, available space, and dimension of the logs determine the kind of andiron to go for. It should be too small such that it can properly fit large logs or too large that small logs fall through. Durable: Due to its closeness to the fire, it should be made of materials that are fire-resistant, won’t rust or corrode, and are long-lasting. No Assembly: The right product should come already assembled and all the user needs is placing it near the fireplace and adding the logs. 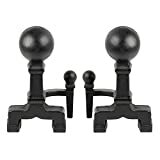 This pair of ball andirons from Uniflame brings out an authentic and classic appeal. This is credited to the use of solid brass, steel construction, and black coating. The fairly large end balls fairly secure the logs while the low-lying steel legs together with the 17-inch height improve the airflow. Although sturdy it is light weight and this improves portability. You should consider this pair of andirons if you want elegance, authenticity, affordability, and portability. However, you may find the legs a bit short and the hollow posts not very strong. 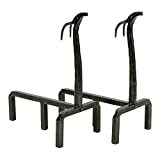 Constructed from wrought iron, these andirons from Minuteman International should look good in your home or office. 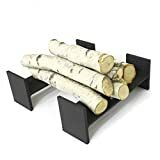 They can conveniently accommodate most logs courtesy of their width of 11 1 /2 inches and height of 10 1 /2 inches. The X300020 features 6-inch balls and black polished iron finish. Among the main reasons, people choose these andirons to include; solid construction, no need for assembly, a range of dimensions, and good build. However, there are those who find the andirons a bit plain, and they are not designed for outdoor use. If you love the vintage appeal, then the Plow & Hearth Key andirons would be a good option. Made of cast iron, this set features a Victorian-styled key design that is not only authentic but will take you back in time. The uniquely-designed piece should look good in both modern as well as traditional-styled homes and requires no assembly. It measures 10 inches long, 17 inches high and 7 inches wide and will support most types of logs. It’s liked because it’s beautiful and elegant, well constructed, and heavy-duty. Unfortunately, it’s a bit high, and the back isn’t very deep. Stacking logs while using the hearth or fireplace is both convenient and trendy when using these Minuteman Internal AND-07 andirons. 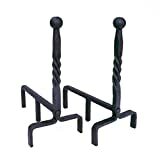 Constructed from sturdy wrought iron, these andirons should support even the heaviest of logs and remain firm and stable. And to prevent sagging, there is an extra leg at the center. The twisted rope ball ends are not only functional but go a long way in bringing out the traditional appeal. Its positives are; heavy-duty design, suitability for the indoors and outdoors, durable and elegant. Its negatives are; relatively heavy and also somewhat plain. Suitable for both indoor as well as outdoor use, the Cyan Design fire andirons measures 6.5 inches wide, 23.5 inches deep and 24 inches high. It’s made of cast iron and coated with canyon bronze paint. 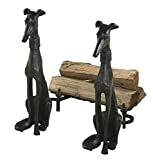 The two dog figures together with the cast iron construction give it a traditional and rustic appeal that will complement contemporary as well as traditional-styled homes. Other than enhancing good air flow and provide good support, these andirons set is loved for its classy nature and sturdiness. However, it’s relatively slim and not very suitable for large wood blocks. Measuring 14 (L) x 9.1(W) x 12(H) inches, the Esschert Design andirons will not only improve functionality but also make your fireplace quite stylish. The 2-piece set is made from cast iron and features brown color that gives it an antique look. Its design holds the logs at a right height and also boosts air flow. Consumers go for this particular product because it’s well-made, it feels quite solid and can withstand high heat. Nevertheless, some people say that the andirons are not the lightest and are also plain. The Minuteman International andirons are made from high-grade wrought iron that guarantees you of reliability and longevity. It measures 7.25 inches wide, 15 inches deep, 15.25 inches high and is perfect for most logs. The ends feature maple leaf design that makes it very attractive and is powder coated for longevity and comes in black. The andiron set is suitable for the indoors and outdoors and is loved for its great looks, solid construction, and sturdiness. However, it’s not that long and is also a tad bit heavy. The Pelloa fireplace andiron comes in the form of an I-beam and is made from reclaimed steel. It measures 15.75 inches long, 5.56 inches high and 4.5 inches wide. The US-made product has been filed and sandblasted by hand to give it the contemporary appeal. It features raised edges on both the rear and front that keep the wood intact and is coated with fire-resistant charcoal gray paint. People love this accessory because it’s very strong, stable and also simple to use. Some, however, don’t like its plain nature and it’s somewhat bulky. 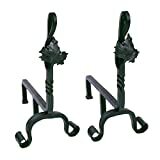 The Uniflame A-1251 andirons come in cat figurines and are made from cast iron. They measure 17 inches high and provide good airflow to your logs in the hearth or fireplace. The accessory is well-built to support the logs and should last for a long time. And to bring out the antique and authentic appeal, the pieces are powder coated in black. Some of the positive comments include authentic and trendy design, strong and stable, and durable. The negatives of these andirons are they aren’t very large, and the glowing green eyes can be a bit scary. Featuring deer designs, these Andirons by Minuteman International are ideal for modern and traditional homes. Each piece is made of cast iron and measures 9 inches long, 15 inches deep, and 18.5 inches high. It’s powder coated in graphite for elegance, durability and also protection against wear & tear and the elements. The deer andirons consist of a center leg for additional support and can be used indoors and also outdoors. The pros are sleek design, stylish, solid and stability whereas its cons are it’s somewhat heavy and has a primitive look. Like many other people, you may still be an ardent fun of fireplace andirons. Maybe you love their authentic appeal, classic look, or use them for decorative purposes. Whichever your reason for using these accessories, it’s always important to give priority to functionality, reliability, elegance, and durability. But with all kinds of products, choosing an item can be a challenge. The good news though is that we have compared various items and now present the top 10 best fireplace andirons in 2019. Follow these reviews and own a top product.